It seems that spring weather has already jumped right in our laps and excuses for putting off all the yard work and outdoor plans are quickly running low. There is no better time of year to get out and enjoy the fresh air and rejuvenated wildlife and there is no better adventurer with which to do it than your dog. Throughout the months of May & June, Acme Canine will hold Woofie’s FunWALK Challenge. Everyone and their dog are encouraged to sign up by April 30 and see if they are up to the task. It is essentially a walkathon that consists of earning points per steps with your dog. Acme Canine will announce who completed the challenge on June 30. Participants can win prizes based on combined pounds lost, best dog photo and on completing the challenge. The cost to participate is $25, but it includes several benefits with the package. Participants will receive a dog walking booklet with access to track their steps on the web, an Acme Canine leash, and the opportunity to attend either the obstacle course held on May 2 or June 6, or a Walking without Pulling workshop held on May 6, May 23, June 13 or June 24. Americans have unfortunately become well known for the obesity epidemic and overall sedentary lifestyles we live. It’s no surprise that many of our pets are suffering from the same poor diet and inactive behavior as well. Canine obesity leads to the same types of health and quality-of-life issues that the human variety does. 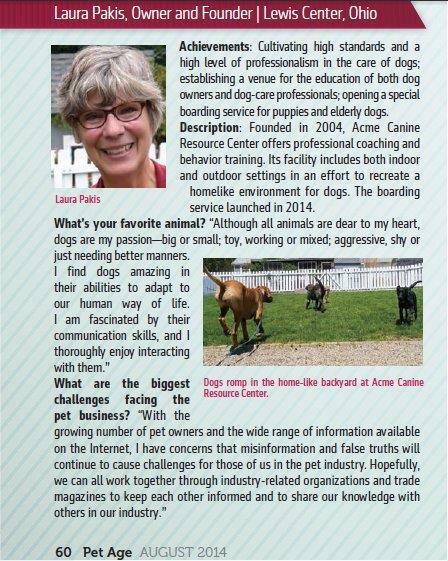 Acme Canine hopes to shed some light on the issue while helping dog owners build better relationships with their dogs on the FunWALK Challenge. For those interested in joining this funWALK challenge, contact Acme Canine at (740) 548-1717 or training@acmecanine.com. This entry was posted in The History of Acme Canine. Bookmark the permalink.